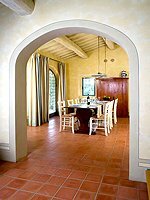 Holiday villa with swimming pool in Empoli countryside, between Lamporecchio (Pistoia) and Vinci (Florence). 5/7 sleeping accommodations, satellite TV, barbecue, wood-burning oven, Internet access. 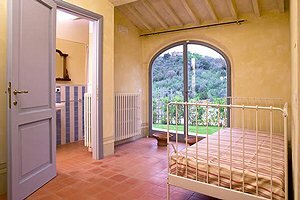 The villa (5+2 sleeping accommodations) is situated between Vinci and Lamporecchio, in Empoli countryside, in the heart of Tuscany. 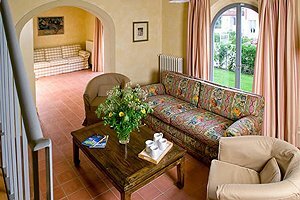 Florence, Pisa, Lucca, Siena, San Gimignano, Montepulciano, Pienza, Montalcino and other important Tuscan cities of art and culture are easily reached by car. 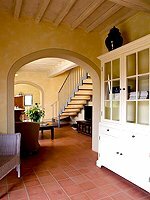 The building is surrounded by the typical Tuscan landscape, made of rolling hills covered with olive groves. 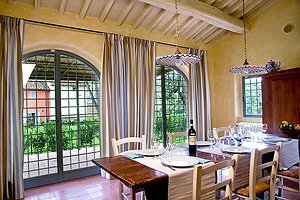 The windows look onto the wonderful Villa Rospigliosi, dating back to the 17th century. 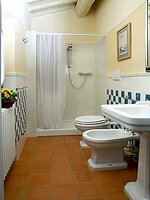 The villa is provided with all comforts (satellite TV, Internet connection, baby cot, oven, fridge, washing machine, iron and ironing board, dishwasher, heating system and parking). 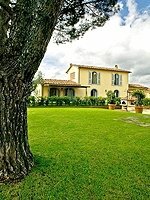 In the garden are the swimming pool (8x3 m), the barbecue equipment and a wood-burning oven. 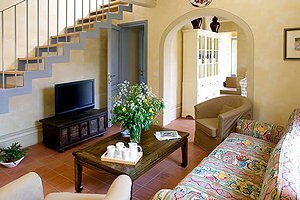 The rooms of the villa (2 double bedrooms, 1 single bedroom + double sofa bed and 3 bathrooms) are deployed over two floors. 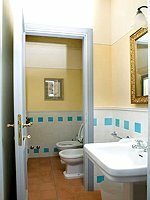 The ground floor composes of kitchen, two living rooms, 1 single bedroom with ensuite bathroom and a second bathroom. The kitchen opens onto a covered terrace. 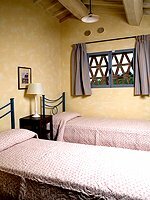 On the first floor are 1 twin-bedded room, 1 double bedroom with canopied bed and 1 bathroom.